Approximately one year ago, Rocky View Council approved the County Plan. As stated on Rocky View County’s website, the County Plan “guides overall growth and development for the County.” It also states that “the master plan is to guide development and services for the next 10 years.” The County Plan currently guides the thinking and approach in planning documents and implementation throughout the County. It includes a vision statement which states “Rocky View is an inviting, thriving, and sustainable County that balances agriculture with diverse residential, recreational, and business opportunities.” At the time the County Plan was approved by Council, there were many voices who felt that the plan was too restrictive and heavily weighted towards a prescriptive “planner’s view” of what Rocky View should become, versus a more open approach that would allow the market and landowners to shape what works for Rocky View within the planning framework stated in the Municipal Government Act. As a concession at the time, Council agreed there would be an annual review of the County Plan. On Oct. 7, 2014, the Rocky View Council’s Policy and Priorities Committee will hear a presentation from County Administration evaluating the first year implementation of the County Plan. Rocky View 2020 is requesting an opportunity to provide our perspective and evaluation on the first year of the County Plan at this same time. We are encouraging our supporters, and others in the community, to also request an opportunity to speak or send your comments to the chair of this committee (Chairperson and Councillor Lois Habberfield at lhabberfield@rockyview.ca). We encourage you to support changes to the County Plan that allow for a more open approach and the less restrictive/prescriptive planning document. This is important because this document shapes the vision of what Rocky View can become, and could benefit us all for years to come. A year ago, during the review of the draft County Plan, a number of people who found they shared similar concerns got together in an ad hoc way and developed a list of changes that they proposed be made to final draft of the County Plan. By narrow vote, these amendments did not make it into the plan. These proposed amendments are still valid today. They are focused on removing arbitrary restrictions and prescriptive planning approaches and allowing for a more open vision of what people (rather than planners) want. These amendments, proposed a year ago, can be seen by clicking this link. We are encouraging our supporters, and others in the community, to also request an opportunity to speak or send your comments to the chair of this committee (Chairperson and Councillor Lois Habberfield at lhabberfield@rockyview.ca). As stated, the existing County Plan focuses on restricting the level of growth. It also attempts to direct where that growth will occur, without acknowledging market preferences and servicing concerns. The existing plan calls for no more than 3% of the growth in the overall Calgary Region’s population to be directed to specific areas in the County. The restrictive emphasis that runs throughout the current County Plan seems to be behind many of the current challenges in our County. For example, when reviewing the residential housing stats across the Calgary region, we can see that it is been more than four years since Rocky View has even achieved its prescribed “moderate growth” of 3% of the Calgary Region. In addition, the growth rate is trending down and is well below 1.5% in 2013 and the first two quarters of 2014. (Click here to see the chart.) This trend down in residential growth comes at a time when Calgary and the rest of the region is experiencing unprecedented growth. 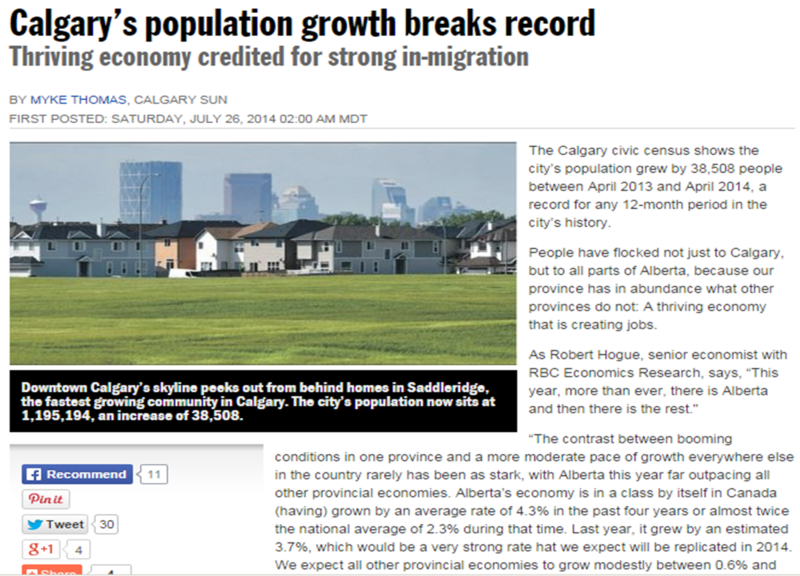 From April 2013 to April 2014, Calgary’s population grew by a record-breaking 38,508 people. (Click here for report). Therefore, at a time when the region is experiencing its strongest growth, Rocky View’s participation in that growth is rapidly trending down and is well below Rocky View’s own stated growth targets. At a time when the region is experiencing its strongest growth, Rocky View’s participation in that growth is rapidly trending down and is well below Rocky View’s own stated growth targets. If Rocky View is to achieve the vision of an ‘inviting, thriving and sustainable county,’ we must change our attitudes and our culture and reflect these changes in the County Plan. It is a type of vision-casting document for the future of Rocky View. We are at a real turning point. Fight the future or shape it. We have a once-in-a-generation opportunity to bring people across this large County together in a positive, progressive way, to shape a ‘made in Rocky View’ future instead of having one imposed on us. We need your involvement.